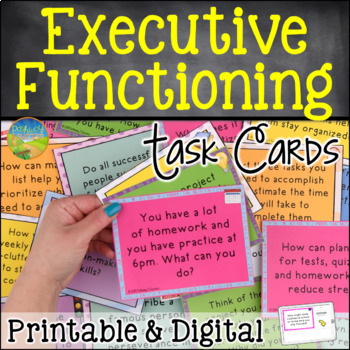 Executive Functioning Task Cards are a set of 240 task cards that focus on all areas of executive functioning skills: planning, time management, working memory, self control, flexibility, organization, task initiation, metacognition, attention, and perseverance. A page explaining each skill is also included. The task cards are aimed to help students at higher elementary, middle, and high school who need help with their executive functioning skills. Many times, these students are very bright but perform poorly in school because they are lacking these skills. Learning these skills can benefit of number of students also requiring special education services, such as students with ADHD, learning disabilities, and more. The cards can be helpful for a range of professionals, including regular education teachers, special education teachers, 504 coordinators, tutors, mentors, and other support professionals. These materials can also be used during advisory for middle and high school students. • Set up class centers for each executive functioning skill. Allow small groups to walk around and work at the center until time is up. Then, they can move on to the next executive functioning center. 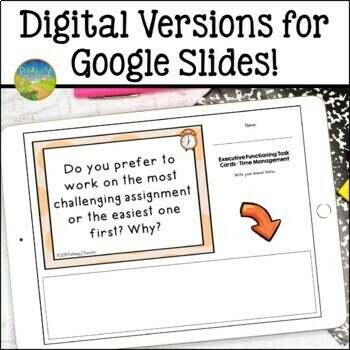 • Use a card each morning as part of a guided class or small group discussion. This can also be part of a morning meeting. • Group students up to discuss the task cards. Each group can focus on one particular executive functioning skill. Have the group then share out what they learned about the skill. • Allow students to pick a card and random and discuss in a small group. Let the students run the group discussion. • Have students independently read a card and respond in their journal before talking with a partner or group about it. Target executive functioning and study skills necessary for academic success at the middle and high school level. The bundle includes over 400 pages full of lessons, templates, crafts, and workbook pages to teach study strategies and ways to improve executive functioning skills. It includes a HUGE selection of my executive functioning and study skills materials in one place.